Custom homebuilders are doing more work than ever, and thanks to readily available information on the Internet, homeowners have become a great deal savvier about what they want to see created in their custom homes. These builders must then obtain a range of skilled subcontracts, from plumbing and electrical to electronics systems contractors. Further, when it comes to high-quality theater system creation and installation, there are five things a professional technician can do to help. Builders have to operate on a timeline and within a certain framework laid out by the homeowner. An electronic systems contractor can assist in making sure a home is finished on time and on budget by doing three simple things. Those three things are: knowing what they are going to install, when it needs to be installed, and what assistance they are going to require in the home from other professionals. 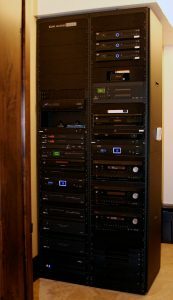 For example, if a homeowner wants an A/V cabinet installed in a particular location in the home, a home theater technician can liaise with the framer to ensure that sufficient space is allotted. Technicians also work with electricians to make sure that enough outlets will be available for all of the necessary cabling and wiring that a home theater system will need. 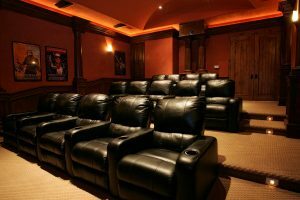 In addition to working with other contractors in a home, a home theater programmer can also work with builders by providing information about: how much space will be needed for home theater equipment, where in the house it will be going, and how all of the equipment is going to be stored. Speaker dimensions are a key concern in building proper enclosures and obtaining maximum sound quality. Further, how this equipment will be stored – be it slide-out or built-in racks – can also make a difference when it comes to placing other features in the home. Take architectural speakers as an example. Accommodating these speaker in a home will require proper ceiling wiring as well as room for housing, an element that a builder must be aware of prior to beginning work. Or, consider custom-made speakers by Triad – the company offers a range of custom-built speakers and housings that must have space allotted for them in the home. In addition, electronic systems contractors must consider the need for cooling and ventilation of systems. Options like motorized TV lifts must be properly maintained in order to ensure smooth functioning, and a builder must know about such systems in advance to account for them. By being upfront about what, when, who, where and how, an electronic systems contractor can help smooth the custom-home building process. Remember to consider these important steps when you are planning to install a home theater for your home or upgrading your current media room. Got questions? Please inquire HERE . Free Consultation is available, for new clients.